Strauch is the medical and science editor for the NYT, and so knows how to write great journalistic stories, and this one seemed to be one of those books that one reads at just the right time. In the U.S., aging seems to be a culturally negative thing in general and the common assumption seems to be that aging means losses of some kind: your friends/family die/move, you get stiff, you have more medical problems, it’s harder to learn stuff, you forget everything and you’re THAT much closer to developing dementia and/or dying. Suddenly, there are all these “Over the Hill” birthday cards (black for the oncoming funereal process), and AARP sends you a membership card and the next thing you know you’ll qualify for the Senior discount at Furrs and have supper at four in the afternoon. Strauch’s book authoritively turns all this on its head, which was fun to read and backs it up with research. The first half of the book covers the various research studies that have proven that the middle-aged brain does not die off and that forgetting what you watched on TV last night is not a sign of oncoming dementia for most people. 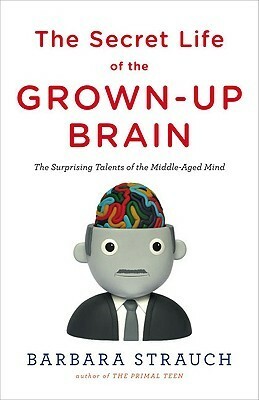 It’s a little too rosy in places for me and a little bit heavy on the cheerleading, but it’s also fascinating to read about the possibility of neurogenesis (growing new brain cells) and learning to focus on the strengths of an older brain. Some of this ability to see the bigger picture is due to having years of experience (so it’s easier to see how things fit in long-term), but it’s also linked to education. Loads of studies show that the more education that one has the lower your risk for (or the higher your resilience to) Alzheimers, so learning is good especially as you get older. (Love that.) It’s also easier to see the connections between disparate topics as you age which refers back to seeing the bigger picture more clearly. And yes, it’s true – middle-aged brains do tend to get more easily distracted at the start of a project (“Squirrel!”) and to forget things (such as names of people). Strauch explains that this forgetting process is more of a retrieval problem than a disappearing problem – the names are there (tip of the tongue type thing). We just have to take a little more effort to get that information than we would when we were younger — just need to access it slightly differently, it seems. And we’re more likely to forget the names of people who we don’t know that well and who we haven’t seen for ages – makes sense to me really. As for how to engage your middle-aged brain and keep it sharp and growing, Strauch (backed up by the researchers that she interviewed) is a huge proponent of exercise (i.e. regular aerobic exercise) as this has been found time and again as the only way for your brain to have neurogenesis (i.e. grow new brain cells). There’s been an age-old argument about how your brain stops growing once you’re older and it only shrinks etc. That is really not true, and Strauch has the research conclusions to prove it. Perhaps that is why I really enjoyed the book – that it supported how I think and live. It’s always nice to be told that you’re doing the right thing. This entry was posted in Uncategorized and tagged Books in general, gender roles, medical, Non-fiction, public health by lizipaulk. Bookmark the permalink.